The LNCS journal Transactions on Rough Sets is devoted to the entire spectrum of rough sets related issues, from logical and mathematical foundations, through all aspects of rough set theory and its applications, such as data mining, knowledge discovery, and intelligent information processing, to relations between rough sets and other approaches to uncertainty, vagueness, and incompleteness, such as fuzzy sets and theory of evidence. 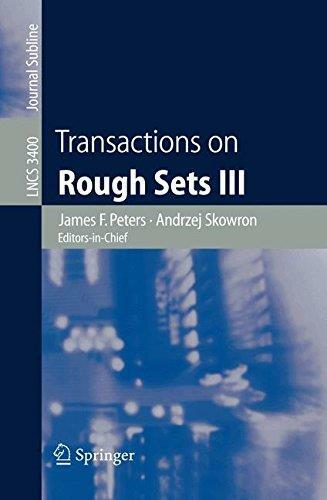 This third volume of the Transactions on Rough Sets presents 11 revised papers that have been through a careful peer reviewing process by the journal's Editorial Board. The research monograph "Time Complexity of Decision Trees" by Mikhail Ju. Moshkov is presented in the section on dissertation and monographs. Among the regular papers the one by Zdzislaw Pawlak entitled "Flow Graphs and Data Mining" deserves a special mention.